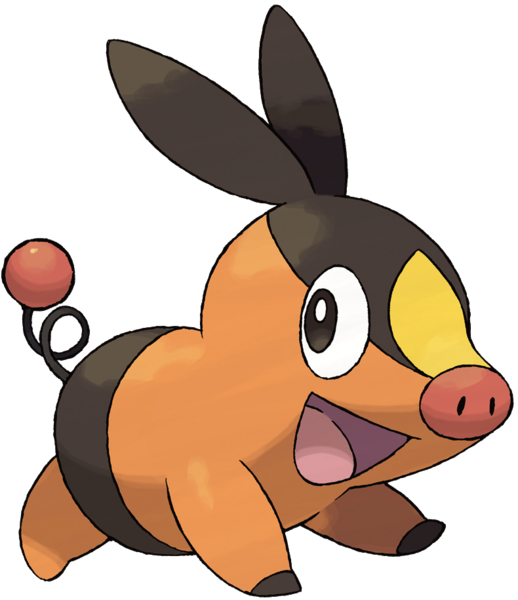 Tepig is a pig-like Pokémon, primarily orange in coloration with the additional colors of black, pink, and yellow on various portions of its body. It has large, ovular eyes, an archetypically piglike ruddy-pink nose, and a thick stripe of yellow over its snout. Much of its face has black coloration, and its ears, long and oblong, are positioned closely together on the top of its head. Tepig has short legs, with the extremities of its forefeet being black in coloration. There is a band of black on its lower back and rear, from which extends its coiled tail, topped with a ruddy-red bauble-like adornment. It can blow fire from its snout. Tepig are very nimble which allows them to dodge attacks with ease. Tepig uses its fire-breathing abilities to cook its food. Tepig will blow smoke from its nose instead of embers if it becomes sick. It has been shown to wag its tail when happy. In case you don't have Cartoon Network. Well we finally have it, and if you love Pokémon, you probably already know the names of the three starters for Generation 5. From left to right, names are Snivy, Tepig, and Oshawott. Honestly, I don't mine the grass and fire starters name, but the water starter's name is very Japanese compared to the other two. Oh well. More importantly, what do you think?